Objective: The objectives of this study are to study the pattern of tobacco use in Indian school children aged 10–15 years in Wardha district and to study the role of psychosocial factors in initiation and prevention. 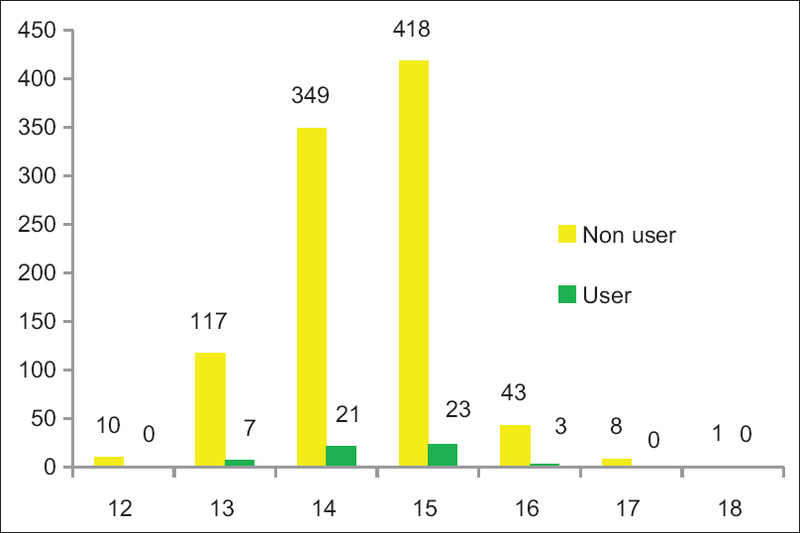 Materials and Methods: A descriptive questionnaire cross-sectional study to evaluate the patterns of tobacco use in India among school children aged 10–15 in Wardha district. Results: Of the total of 1000 children selected, 5.9% were tobacco users and out of these 3.7% claimed to be addicted to it. Among the habitués, the mean age of initiation of tobacco use was 11.65 ± 2.62. The possible causes being peer pressure (35.08%), tension (49.12%), to achieve the aim (5.26%) and influence from parents (10.52%). Among the habitués, a mean number of 2.71 ± 2.03 children were using tobacco regularly with the range of 1–5 times per day. Conclusion: The peer group influence was the reason for initiating this habit in majority of the users. It is better to prevent the initiation of the habit than trying to stop the habit. The present study suggests the need for school-based tobacco prevention programs. Joint efforts from family, school, and social welfare groups are needed to address these factors for effective prevention, in addition to raising awareness against tobacco use among the school students. Tobacco use in children and adolescents is reaching pandemic levels. The World Bank has reported that nearly 82,000–99,000 children and adolescents all over the world begin smoking every day. About half of them would continue to smoke to adulthood and half of the adult smokers are expected to die prematurely due to smoking-related diseases. The number of people in the age group of 18 years and younger in the world today is 2.4 billion, which is the largest generation in history. Since most of young people in developing countries are currently nontobacco users, tobacco industry especially targets them. If the current smoking trends continue, tobacco will kill nearly 250 million of today's children. Nearly 5 million people die due to tobacco use every year, and this figure will increase to 10 million tobacco attributable deaths per year by 2020. India is the second most populous country in the world. India is the third largest producer and consumer of tobacco in the world. The country has a long history of tobacco use. Tobacco is used in a variety of ways in India; its use has unfortunately been well recognized among the adolescents. Tobacco addiction of a large number of adults has been initiated during the adolescence. It was estimated in 1999–2001 that 5500 adolescents start using tobacco every day in India, joining the 4 million young people, under the age of 15, who already use tobacco regularly. In developing countries, the most liable time for initiating tobacco use in is during adolescence and early adulthood, ages 15–24 years. Most tobacco users start using tobacco earlier at the age of 18 years, while other starts at young age of 10 years. It was assess in 1999–2001 that 5500 adolescents started using tobacco every day in India, coupling with the 4 million young people, under the age of 15, who are already tobacco user already. Many factors impact tobacco use among adolescent students. Addiction to tobacco products and other substance of abuse among family members and peer groups, family conflicts, poor school performance, truancy, and school dropouts has been found to be related with smoking at an early age. The impeachment of tobacco epidemic in India are complicated, due to great variety of tobacco used and marked variations in prevalence and patterns of tobacco use. The Global Youth Tobacco Survey (GYTS) supported by the World Health Organization and the Centers for the Disease Control and Prevention conducted during the years 2000–2004 in India, is the first survey that provides state-wise data on youth (13–15 years), using a standardized methodology. The prevalence figures of ever and current tobacco use varied across states, as per GYTS results. Current prevalence of tobacco use, in any form, among school-going youth (age 13–15 years) in India is 17.5% (range: 2.7%–63%). Current smokeless tobacco use was related by 14.6% (range: 2.0%–55.6%) and current smokers were 8.3% (range: 2.2%–34.5%). High prevalence was reported in the North Eastern states and Bihar. Low prevalence was reported in Andhra Pradesh, Chandigarh, Delhi, Goa, Haryana, Himachal Pradesh, Karnataka, Punjab, and Tamil Nadu. The tobacco situation in India is different because of a vast form of tobacco products available for 300 smoking as well as smokeless use. Smoking of cigarette and mainly beedis and chewing tobacco (smokeless use) is an age-old practice in India. However, according to story of evidence with the changes in the process of growth of societies, the prevalence of smoking in women and young children has raised considerably and has become significant public health problem. Among nonsmoking, nonsusceptible adolescents, viewing a favorite advertisement, make children two times more prone to smoke after 3 years, as compared to those who do not see a favorite cigarette advertisement. Similarly, keeping of a cigarette promotional item, such as a cap or jacket, makes children three times more likely to smoke. Only 20% of the tobacco devour in India by weight is consumed as cigarettes, 40% consumed as bidi, and the rest in smokeless forms. Everyday about 80,000–100,000 young people begins smoking worldwide out of which most are in the developing countries. Eight of 1000 teenagers who smoke today, 500 will eventually die of tobacco-related diseases-250 in their middle age and 250 in their old age In India, tobacco use is likely to cause 800,000 deaths annually. Considering the health complications associated with tobacco use, it is very important to understand the factors which will lead to its use and to plan strategies to reduce its use. This is especially very common for the developing countries like India, where tobacco use continues to be a common habit and without knowing the harmful consequences of its usage. A descriptive questionnaire cross-sectional study to evaluate the patterns of tobacco use in India among school children aged 10–15 in Wardha district. All Government Middle and Higher Schools in Wardha district were enlisted along with their student enrollment. Subsequently using population proportionate to size sampling methodology, ten clusters (schools) were selected. From each school, 300 children in the age group of 10–15 years were randomly selected with the help of random number table for the detailed study. The exact age of the children was verified from school records. The sample size was calculated using the least prevalence of tobacco consumption at 6% reported by Mohan et al. considering relative precision of 15% to study the prevalence of tobacco the minimum sample size required at 95% confidence level was 2785 children. Therefore, it was proposed to cover a total of 3000 children in the age group of 10–18 years. The informed consent was obtained from each student to participate in the study. Data will be collected using a pretested, semi-structured questionnaire after obtaining ethical approval. The questionnaire was administered individually to eachchild. Each selected student was taken into a separate room and was briefed about the objectives of the study. The child was requested to provide information and was reassured about the anonymity and confidentiality of the information. A total of 1,000 children from three randomly selected schools participated in this cross-sectional study. Of the total 5.9% were tobacco users and out of these, 3.7% claimed to be addicted to it. Among the habitués, the mean age of initiation of tobacco use was 11.65 ± 2.62. The possible reasons for initiation of tobacco habit are given in [Table 1], [Table 2], [Table 3], [Table 4]. Among the habitués, a mean number of 2.71 ± 2.03 children were using tobacco regularly with the range of 1–5 times per day. Nearly 1.6% habitués said that they could afford tobacco. The response of the vendors, as said by the children, while they purchased tobacco was that they asked the children's age (20.77%), denied selling tobacco (50%), gave instantly (26.48%), and inquired (2.7%). Out of all the children, 74.2% were aware of the side effects of tobacco. About 84.4% were aware it is harmful for health. About 56.8% were aware that they could get addicted to tobacco. Among all the children, 37.6% agreed to their parents using tobacco at home. About 39.6% said their parents allow visitors to use tobacco at home. About 72.5% of children were educated by their parents about the side effects of tobacco and 67.5% children were warned against its use. At school, 82.2% children agreed to be warned by their teachers about tobacco use. Nearly 66.9% said the side effects of tobacco were discussed in school. About 55% children were influenced by the warnings in movies and television. Nearly 47.2% were influenced by the warnings on the tobacco packets. About 56.7% children were influenced by tobacco use in movies [Table 5] and [Table 6]. Tobacco use in children and adolescents is reaching pandemic levels. The World Bank has reported that nearly 82,000–99,000 children and adolescents all over the world begin smoking every day. About half of them would continue to smoke to adulthood and half of the adult smokers are expected to die prematurely due to smoking-related diseases. If current smoking trends continue, tobacco will kill nearly 250 million of today's children. India is the second most populous country in the world. It is the third largest producer and consumer of tobacco in the world. Tobacco is used in a variety of ways in India; its use has unfortunately been well recognized among the adolescents. Tobacco addiction of a large number of adults has been initiated during the adolescence. Considering the enormous health complications associated with tobacco use, it is of utmost importance to understand the factors leading to its use and to plan strategies to reduce its intake. This is especially relevant for the developing countries like India, where tobacco use continues to be common notwithstanding the recognition of harmful consequences of its usage. The distribution of tobacco users according to age is given in [Figure 1]. A total of 1000 children participated in this cross-sectional study. Of the total, 59 were tobacco users ranging from age 12–16 years. Among these, maximum users (2.3%) were 15 years of age and (2.1%) were 14 years of age followed by 13 and 16, respectively. Overall, the prevalence observed was 5.9%. The prevalence rate observed was highest among participants in the age of 15. In the present study, the least prevalence observed was in the age of 16 years. None of the children of age 17 and 18 were using tobacco products. In this study, we also evaluated the rationale behind the tobacco addiction among the school students which depicted that 49.12% and 45.6% of students used tobacco due to personal and social factors, respectively. Most of the students stated that they were influenced by peer groups (35.08%) and family members (10.52%). Most studies have showed that the family history of tobacco use is strongly associated with youth tobacco use., Harakeh et al. found that tobacco use of the family member influenced tobacco to the younger sibling. However, this study also found that considerable numbers of 56.7% of tobacco use were influenced by movies which strongly supports that social influences were large impact among those who reported starting or increasing their tobacco use. In Dutch students, the mean prevalence of tobacco use was 43.94 ± 20.24. This study reported a lifetime tobacco habit among the adolescents as significantly higher in the females (odds ratio [OR] = 1.73) compared to males (OR = 1.00). A student with best friend tobacco user was 1.33 times, and parental user was 1.29 times associated with risk of developing tobacco use and also observed a lifetime prevalence of 55.45% among regular tobacco use compared nonusers (Otte et al., 2009). The prevalence of adolescent tobacco use estimated was 13.14% among 3041 users of 82 schools, in Canada. In our study, the parent and children tobacco use prevalence were noted 10.52%; friends versus habitués tobacco use were 35.08%. When our study results are compared with Canadian and Dutch studies, it is observed that the prevalence of tobacco users was more in Canada. Parental tobacco use and moving from lower grade class to higher grade class was the main reason for the high tobacco users among Canadian and Dutch children. In Gujarat the prevalence of smoking and tobacco chewing was reported to be 14.61% and 66.23%, respectively. Addiction to smoking and chewing was more prevalent among the age group of 17–19 years (36.36%) and it is shown that addiction increases with age. Associated factors reported in tobacco use were friends (61.69%), parents (11.03%), siblings (7.79%), creating impression (5.19%), and hobby (14.30%) (Makwana et al. 2007). A cross-sectional study conducted in Bengaluru among adolescents reported a prevalence of 6.8%. According to the study, the factors which induced tobacco use and reasons for continuing use among students were style 58.8%, relieves tensions 17.6%, pleasurable 11.8%, and 8.8% because of their friends. The study observed students reporting 35.7% parental smoking (Shashidhar et al., 2011). Here, our study a parental smoking of 10.52%, which is very low compared to that reported in the Bengaluru children. A survey in Gujarat has reported the prevalence of 3.3% smoking in males. Boys (2.74 times) and girls (1.34 times) who have more friends with the habit were at risk of developing tobacco habit. 1.35 times risk of tobacco habit was reported in adolescents whose parents have tobacco habit (Siziya et al., 2008). Our study observed that 35.08% of school children are induced to use because of more friends having tobacco habit. Drawbacks of the present study included recall bias, conscious falsification by the children, small number of children, lack of external validity, no inclusion of the family members and teachers, only school going children included, children were selected from a localized area. Despite these shortcomings, this study found some important and often neglected correlates of adolescent smoking behavior that needs to be addressed. In conclusion, the peer group influence was the reason for initiating this habit in majority of the users. It is better to prevent the initiation of the habit than trying to stop the habit, highlighting the role of primordial prevention. To manage the tobacco dependence at early age of life, appropriate health knowledge and counseling are required. The present study suggests the need for school-based tobacco prevention programs. At present, the secondary school does not address various aspects related to the addiction with tobacco. Joint efforts from family, school, and social welfare groups are needed to address these factors for effective prevention, in addition to raising awareness against tobacco use among the school students. Chadda RK, Sengupta SN. Tobacco use by Indian adolescents. Tob Induc Dis 2002;1:111-9. Muttappallymyalil J, Divakaran B, Thomas T, Sreedharan J, Haran J, Thanzee M. Prevalence of tobacco use among adolescents in India. Asian Pac J Cancer Prev 2012;13:5371-4. National Sample Survey Organisation (NSS). A note on consumption of tobacco in India, NSS 50th round (1993-1994). Sarvekshana 1998;21:69-100. Patel DR. Smoking and children. Indian J Pediatr 1999;66:817-24. Bagchi NN, Ganguly S, Pal S, Chatterjee S. A study on smoking and associated psychosocial factors among adolescent students in Kolkata, India. Indian J Public Health 2014;58:50-3. Reddy KS, Gupta PC, editors. Report on Tobacco Control in India. Ministry of Health and Family Welfare, New Delhi, Government of India; 2004. Narain R, Sardana S, Gupta S, Sehgal A. Age at initiation & prevalence of tobacco use among school children in Noida, India: A cross-sectional questionnaire based survey. Indian J Med Res 2011;133:300-7. Reddy KS, Arora M. Tobacco use among children in India: A burgeoning epidemic. Indian Pediatr 2005;42:757-61. Sinha NS, Gupta CP, Padnekar SM. Tobacco use in rural area of Bihar, India. Indian J Community Med 2003;28:167-70. National Sample survey Organisation (NSS). A note on consumption of tobacco in India, NSS 50th round (1993-1994). Sarvekshana: A Journal of the National Sample Survey Organisation 1998;21:69-100. Arora M, Reddy KS. Global youth tobacco survey (GYTS) – Delhi. Indian Pediatr 2005;42:850-1.